A new paper in Nature Climate Change discusses from where the elite in the USA get their opinions about climate. Echo chambers are significant. The elite are described in the abstract as "the community of political elites engaged in the contentious issue of climate politics in the United States". 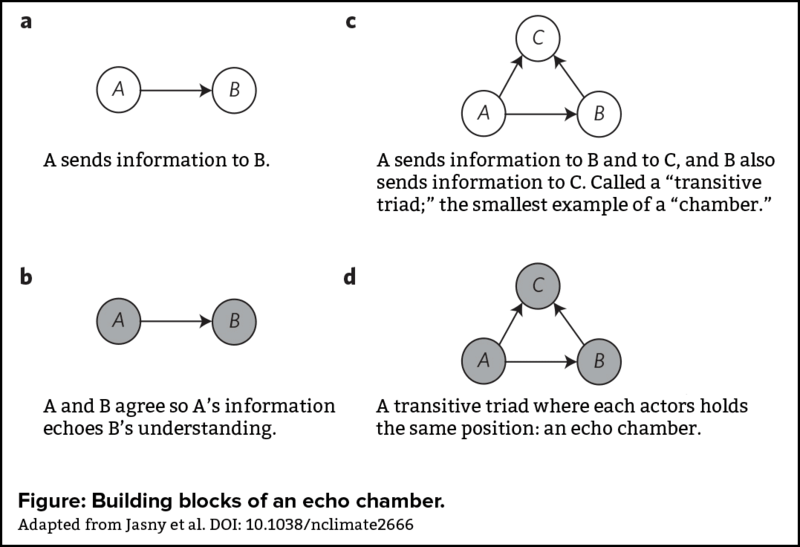 The researchers used exponential random graph (ERG) modelling (don't ask me :D) and found that both "the homogeneity of information (the echo) and multi-path information transmission (the chamber) play significant roles in policy communication". There's a press release at the National Socio-Environmental Synthesis Center (SESYNC) of the University of Maryland (where the lead author, Lorien Jasny, resides). It translates the social science speak into everyday language. Our survey period coincides with the most active and contentious period in the history of US climate policy, when legislation regulating carbon dioxide emissions had passed through the House of Representatives and was being considered in the Senate. In summer 2010, researchers surveyed the most active members of the U.S. climate policy network, including members of Congress and leaders of non-governmental organizations and business and trade unions. Respondents were asked questions about their attitudes toward climate science and climate policy, as well as questions to establish their policy network connections. For example, respondents were asked to identify their sources of expert scientific information about climate change and with whom they collaborate on a regular basis regarding the issue of climate change. If you want to know what an exponential random graph (ERG) model is, all I can tell you is that it is "a complex statistical model for analyzing data about social and other networks". I imagine your imagination is as good as mine :D.
Echo chambers explain why some people hang onto wrong "beliefs" about climate, and why those wrong beliefs gain traction. It's because there are "disproportionate connections among ideologically similar political communicators". “Information has become a partisan choice, and those choices bias toward sources that reinforce beliefs rather than challenge them, regardless of the source’s legitimacy,” Fisher said. Jasny and Fisher point out that the debate on climate change is not indicative of inconclusive science. 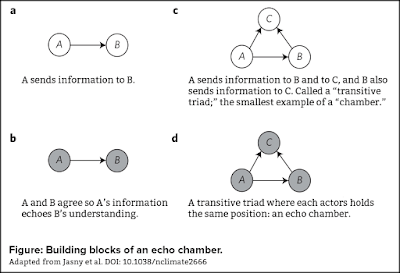 Rather, the debate is illustrative of how echo chambers influence information flows in policy networks. Although I didn't purchase the paper itself, I found the supplementary information a fascinating read. If you get the chance, read up on how the sample was selected, the type of information sought, and some of how it was analysed. The work looks to have been an offshoot from a larger study. The researchers chose "the 100 most active participants in the US climate policy network" drawn from a database they already had. They went through the database and looked to see the recorded activity of each person, weighting some activities (such as appearances before Congress) more heavily. It wasn't just a written survey either. The researchers interviewed each person. They got a 64% response rate, which is rather good, even though it means only 64 people. (It's quite a job to interview 64 people, believe me.) Bear in mind, too, that the research project was to explore how people of critical influence get their beliefs. It wasn't looking at influential people more generally - only those people having greatest influence in climate policy decisions in the USA. The researchers were interested in deep, rather than broad, analysis. First reaction of Anthony Watts - Am I in it? Other than that comment and his headline, Anthony doesn't give his readers instructions as to how they should react. I'll let you imagine the comments (or read them yourself), except for a couple that IMO typify why deniers flock to anti-science blogs. Ian Magness doesn't like being reminded that he's just another anti-science denier. He is insulted and feels demeaned. Good! He dismisses the research as "absurd intellectualising", in much the same manner as I expect he dismisses data relating to surface temperatures, ocean heat, melting ice, ocean acidification, rising seas, fiercer heat waves, more intense downpours, coral bleaching and all the rest. This is just further absurd intellectualising – very much in Lew/Oreskes mode – about how and why people may not think exactly like they do. When are these numskulls going to wake up to the fact the reason we don’t share their views is NOT that we are idiots brainwashed by websites by sites like WUWT and follow their memes like sheep, but that we just look at what real (not modelled) evidence there is and make up our own minds. It’s so insulting to our intelligence to be demeaned in this way. Fortunately, they might be fooling themselves but they are not fooling anybody else with this nonsense. This is the comment that I thought was the most telling. It's from a hard-core denier wickedwenchfan. Makes one wonder if wickedwenchfan will turn out to be an excellent Poe. They just don’t get it, do they? We come to these forums AFTER we have had the message and the so called science shoved down our throats. We come here despite being vilified by mainstream media because after doing our own research the evidence doesn’t add up. Most of us were quite open or even receptive to the CAGW propaganda at first. We don’t come here for group think, we come here to find out if we’re the only ones with serious doubts or objections that we can’t get answers to from the other side and simply sigh in relief when we discover how many other people have been thinking the same! This is one of the reasons it is worth studying Social Network Analysis, for which some background in graph theory saves time. Ok, but does this really tell us something we didn't already know? It was already pretty clear that policy makers who oppose action on climate change were getting their info from echo chambers. This is clear from their associations. Really, they simply had to be, because they reject the science. To reinforce that, they will obviously seek out other people who also reject the science. The same mindset was evident during the last US presidential election, when conservative pundits were sure Romney would win easily, and kept telling each other that even though figures showed otherwise. When the actual results came in, they were genuinely shocked that reality was not dependent on their personal preferences. Rather than worrying about their obvious preference for echo chambers, wouldn't it be more relevant to wonder how it might be possible to increase political pressure on them? Closer to home, it's obvious by now, if you read the signs, that the current Australian, NZ (and Canadian) governments are intending to go to Paris with proposals that are effectively excuses for BAU. What's really needed is to find a way of making them think their political relevance depends on them going against some of their own ideology. For some reason my University's portal to the Nature website is a bit buggy today, so I can't get a proper look at the paper, but it does seem consistent with the growing body of research about how online communities 'Balkanise' knowledge, self-selecting narrow streams of information. You might be interested in another recent study, Williams et al, which further supports this. They found that the vast majority of people involved in online discussions of climate change circulate within like-minded networks. Only rarely is there cross-communication, and that is usually interpreted as trolling. I guess nobody here will be too amazed to hear such observations! I think this kind of research explains both why the regular denizens of blog communities tend to be so sure 'we're right/they're wrong', and why blog communities are utterly unsuitable places to build up reliable scientific knowledge. It's all further evidence for why scientific research communities are the best places to do science. Sou's comment about echo chambers and Hot Whopper was interesting as whichever side of the debate you fall, there seems to be a tendency to gather like minded people around you which tends to stifle open debate. I saw this extract in the Sunday papers which, whilst referencing the recent UK general election, could be equally aimed at all those whose passionate beliefs can cause them to believe that everyone thinks like they do. Personally I regret the absence of those who challenge the echo. At one time people like Joel Shore, Scott Mandia and R Gates would regularly pop up to challenge beliefs at WUWT. That seems to be largely limited to Brandon these days. Without dissenters, debate tends to be sterile. Tony, as you know, most pro-science people have been banned from WUWT. And it's as futile to debate climate science with anyone at WUWT as it is to debate geology and biology with young earthers or near-spherical earth with flat-earthers. The best anyone can hope to do is inject a dose of reality into the madness (and be prepared to suffer the flames). Anthony, as you know, doesn't tolerate science. He's allergic to it. The people who comment there (and at Curry's place and other denier blogs) are mostly conspiracy nutters, with a sprinkling of disinformers, and the rare normal person who hasn't yet been banned. (Anthony keeps on a couple of normal people for his fans to bash). It's impossible to have any rational discussion with people who are behaving irrationally. Why would anyone bother with WUWT? It's not a science blog. It's nothing but a notice board where deniers can post their random "thoughts". I used to put some energy into posting at WUWT - but I've given it up as a Sisyphean task, shoveling information uphill while deniers roll it back down covered in nonsense, shouting insults. While hostile 'moderators' block sensible comments and permit the most atrocious personal attacks on anyone discussing real science or evidence. I just don't see the point - the majority of people posting on WUWT and other major denier blogs simply aren't interested in anything conflicting with their favored conspiracy theories. And quite frankly, undecided readers who stumble upon WUWT _should_ quickly conclude that it's nothing more than a box of nuts, based on the comments. Yes it was ironic WUWT posting an article about echo chambers. The problem with WUWT is the articles can be so bad they are not debatable - check out Lord Monckton's Gish Gallops for example. Or even the moderators calling people Nazis - it's offputing. Surely, if there was such a thing, the denial equivalent of 'realclimate.org' would really struggle for material? That's watt gets me about this - there is no climate science that supports their arguments. Anyone see the latest JAXA?? It's a bit early to write about the Arctic ice - normally. But I've noticed it's at record lows still. (I tried that link the other day and it didn't work. I just tried it again and it still didn't work. Then I tried it in Internet Explorer and it works.